Banana devotees have differing opinions when it comes to the perfect ripeness of the fruit, but many love a banana that beckons with a bright yellow skin dotted with freckled brown spots. Since bananas are picked from their trees when they're unripe, however, the fruit you find in stores is likely to be hard and green. You can speed up the fruit's natural ripening process with just two common household items. 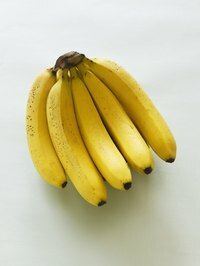 Keep bananas perfect by storing them in the fridge once they reach your desired level of ripeness. They skin will turn brown, but the fruit inside will remain the same. Place the bananas in a brown paper bag. Place an apple along with the bananas in the paper bag. Apples accelerate the process by emitting ethylene gas, a fruit-ripening agent. Seal the bag by folding the open edges several times. Store the bag at room temperature for one or two days, or until the bananas have sufficiently ripened. If you don't have the traditional "brown paper bag," a newspaper can be substituted. Lay a page or two flat on a table, place the fruits in the middle and fold the corners to seal.